Late in the third quarter, with all their wings whirring and Nikola Jokic calmly calling the shots from the center, the Nuggets stretched their lead over the Clippers to 19. Tuesday’s game took on the shape of a blowout. If you want to radically alter the shape of a basketball game, add 7-foot-3 Boban Marjanovic to it, and so the Clippers did. Boban went to work. He played 15 minutes, but you can get the gist in 89 seconds. 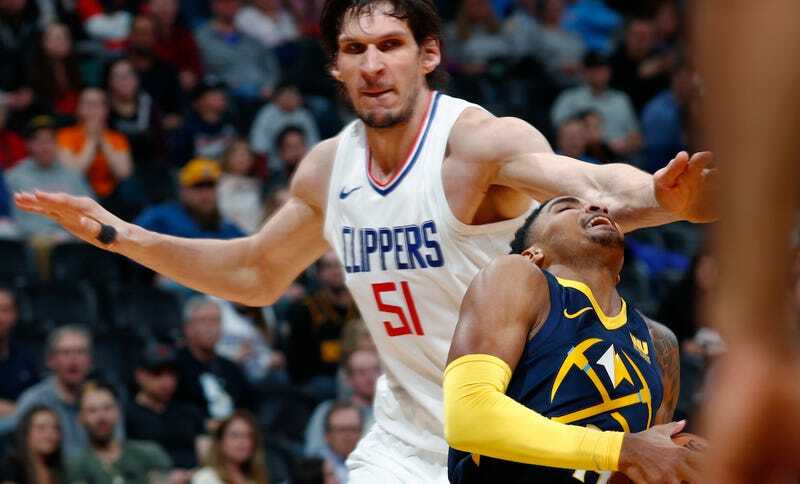 Boban shot 5-of-8 from the field, sunk 8-of-9 free throws, notched six rebounds along with two steals and one block, and finished +27 as the Clippers won 122-120. As usual, the Serbian colossus was tasked with catching the ball close to the basket and putting it into the hoop, ideally with as little time as possible elapsing between those two events. He met that task with raw inhuman size, good footwork, and the occasional slow-moving finesse move. It doesn’t matter whether it’s through post-ups, high pick-and-rolls, or a dribble handoff. Just put the Boban near the hoop and put the ball in his hands, because he’s delivered on 73.9 percent of shots within three feet of the rim across his NBA career. The Nuggets had no answers for this; Boban makes his free throws, too. Denver’s answer was not its star doughboy. Nikola Jokic is a loose lad full of soft curves; Boban Marjonivic is all acute angles and ropey orc muscle. The Clippers left Boban out there as long as they could, shelving DeAndre Jordan to keep his legs fresh for the Rockets tonight. Boban is the most efficient scorer in NBA history, this season averaging a league-best 0.511 points every time he touches the ball. He also doesn’t play a whole lot of basketball, and last night was an exercise in stamina, visibly so—his water-logged locks cementing themselves to his forehead, his shambling gait nearly grinding to a halt. This was just the 23rd time in Boban’s NBA career he’d played 15 minutes, and the second time this season. As fatigue set in, there were some ugly moments on defense: He looked mortal when lined up on the perimeter across from a strong, mobile wing like Wilson Chandler, who assessed Boban’s 9-foot-7 standing reach, 7-foot-9 wingspan, and decided, correctly, that he could make him dance then topple him over like a grotesquely oversized rag doll while finishing easily at the rim. But for the occasional lapses, Boban was the most effective player on the floor nearly every minute he was on it and clawed back a game that seemed lost. Boban Marjanovic cannot turn in a full game of NBA basketball, but he can provide a brief injection of lead-footed intensity. That’s all the Clippers really needed from him last night. Gregg Popovich On Boban Marjanovic: "He&apos;s Not Some Sort Of An Odd Thing"